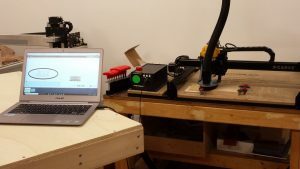 On 2/23/19 I taught my first “Introduction to Python” workshop at Ocean State Maker Mill. What a great experience getting a chance to interact with everyone that attended. The class slides and code are available on GitHub. This workshop is designed to be a fun introduction to the Python language and micro-controllers. Over 3 hours we will explore programming concepts with Python while we implement a project to translate sound into a colorful light display. 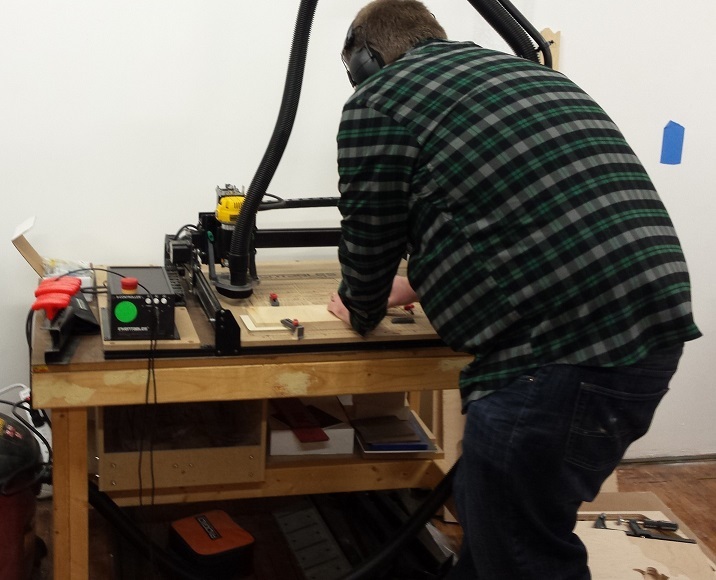 This is a beginner class, no prior programming experience is needed. 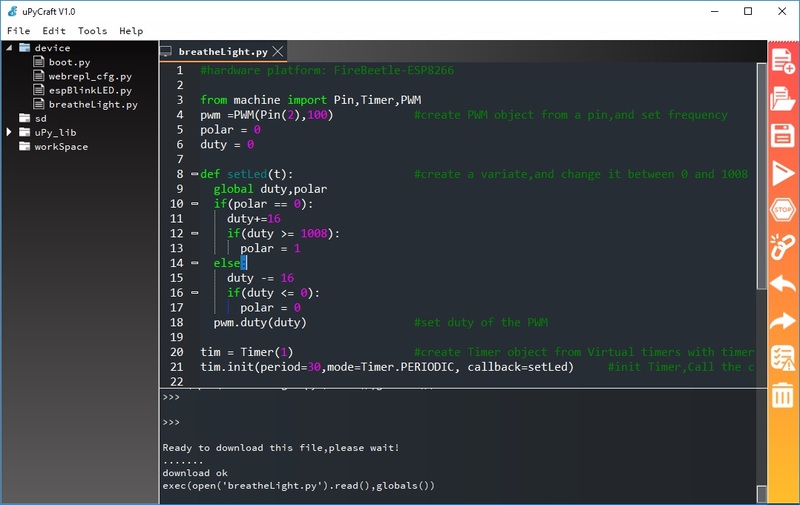 At the completion of the class you will have your own Circuit Playground Express to take home, programmed in Python to create a colorful light display in response to sound. 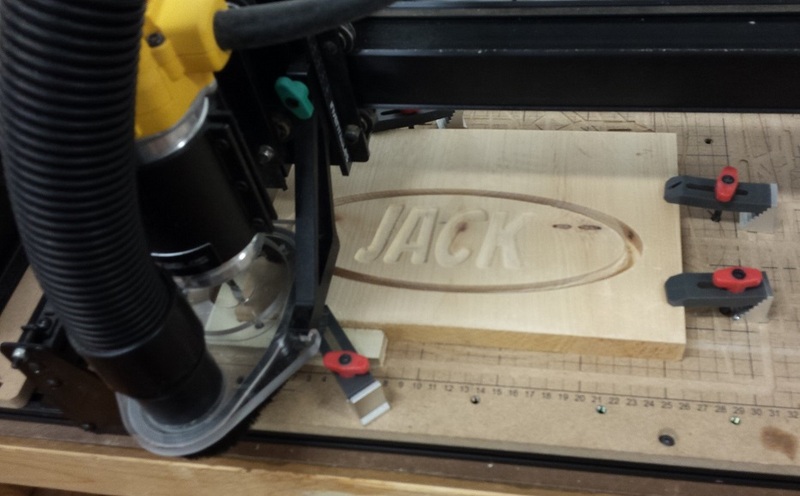 You will be on your way to creating your own interactive projects! The other MicroPython ESP32 APA102/Dotstar library was written by me. At the time I started the project I didn’t know that Matt was working on his library. In any case I needed a working APA102/DotStar library for a project using MicroPython 1.9.4. so I wrote one! At this point my library is probably only of historical interest. My class implements the Adafruit DotStar API, the MicroPython ESP8266 APA102 API, and the MicroPython SPI DotStar API. The code is derived from the Adafruit DotStar CircuitPython class and back ported to MicroPython. The focus of this implementation is backward compatibility, performance was a secondary goal. If GPIO pins are specified for clock and data the older lower performance “bit banging” technique is used rather than the newer software SPI technique. This preserved the existing API that only required clock and data pins instead of an SPI object. Two example/test files are included. The examples show simple class usage and some variations on the Adafruit DotStar examples that are more compact. I just discovered a new (to me) MicroPython IDE, uPyCraft by DFRobot. 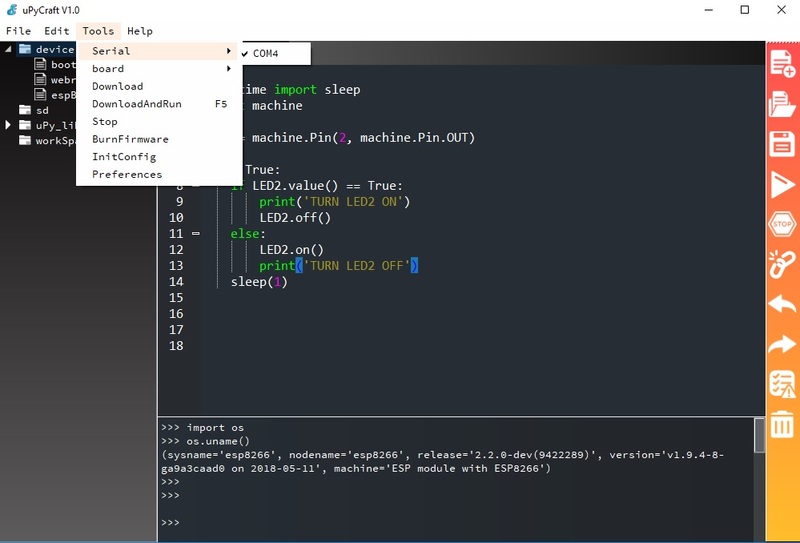 It’s a great little IDE modeled along the lines of the Arduino IDE. It has cross platform support: Windows, Linux, and Mac. It supports multiple ESP versions. I tested with a WEMOS D1 Mini Lite with no issues. However, I did not try to flash the firmware. I had one minor issue with the uPyCraft installation on Windows. uPyCraft requires the SourceCodePro font and has trouble locating the version I had installed. If you click “OK” you can install the font. If you click “Cancel” the font file is copied to your desktop. You can right click the font file to install it. Once the font is installed uPyCraft ran without issues. To connect to your ESP board click on the ESP serial port, Tools->Serial-><COMx> . You can also click on the Connect/Disconnect icon, the chain icon, on the right tool bar. 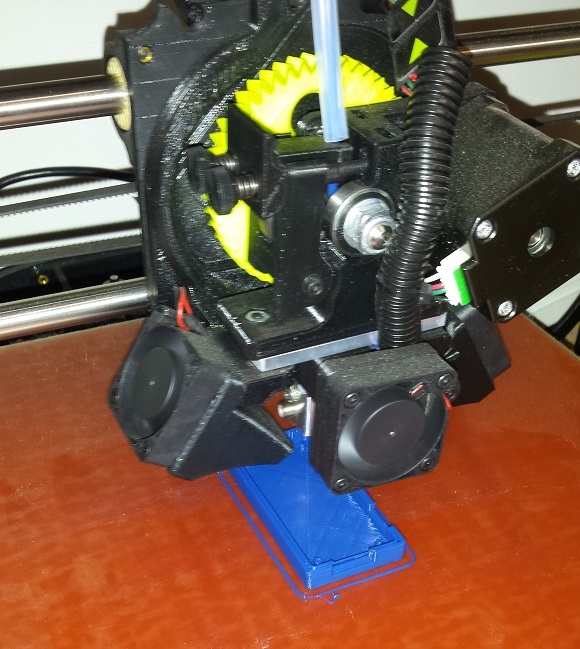 DFRobot includes a nice set of examples with uPyCraft. The REPL window supports editing keys and command recall. The files on your ESP are listed on the left under “Device”. Right clicking on a file gives you a list of options, including editing in place, running, deleting. Very nice, clean, easy to use design. In my limited testing uPyCraft was reliable with no issues. To complete our ESP on the cheap development environment we need some additional tools to turbocharge our productivity. I did a survey of available tools and found two that meet the criteria for Windows, Mac, and Linux cross platform support and have multiple ESP board vendor support. The first tool is a command line utility that makes it a breeze to perform file operations and run MicroPython programs on the ESP: Adafruit’s ampy. The second tool is the Pycharm IDE with the MicroPython plugin. First, let’s take a look at “ampy”. “ampy” provides simple, but vital, ESP file system functionality, reliably. The usage information below spells it out clearly. Ampy is a tool to control MicroPython boards over a serial connection.Using ampy you can manipulate files on the board's internal filesystem and even run scripts. -b, --baud BAUD Baud rate for the serial connection (default 115200). -d, --delay DELAY Delay in seconds before entering RAW MODE (default 0). get           Retrieve a file from the board. ls              List contents of a directory on the board. mkdir     Create a directory on the board. reset       Perform soft reset/reboot of the board. rm           Remove a file from the board. “ampy”, it simply works. Nice. 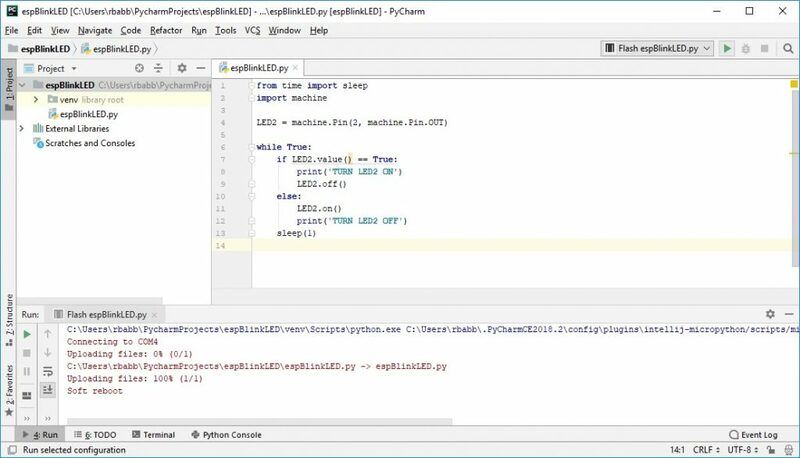 However, you can install and configure the Micropython plugin from within PyCharm. That’s what we are going to do. Go to File->Settings->Plugins->Install JetBrains Plugins, search for MicroPython and install the plugin. On Windows the plugin did not detect my WEMOS D1 MINI ESP8285. I had to enter the COM port manually. In my case COM4. Select your device type, the ESP8285 is equivalent to an ESP8266. 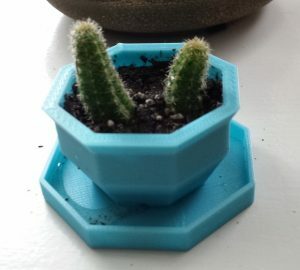 Enable MicroPython support. Plug in your ESP board if you haven’t already. We will bring up the ESP REPL to verify that our installation is working. Select Tools->MicroPython->MicroPython REPL. I had to hit the reset button on my ESP to get it to work the first time. After that I didn’t have any issues. I found that none of the text editing keys worked in the REPL window, backspace, command recall, etc. So keep that in mind if you are planning to do extensive work in REPL. You may want to just open a terminal session (PuTTY on Windows). To transfer files to the ESP you create a “flash” configuration, by right clicking on the file. Once created it is a simple matter to run the configuration and copy the file to the ESP. 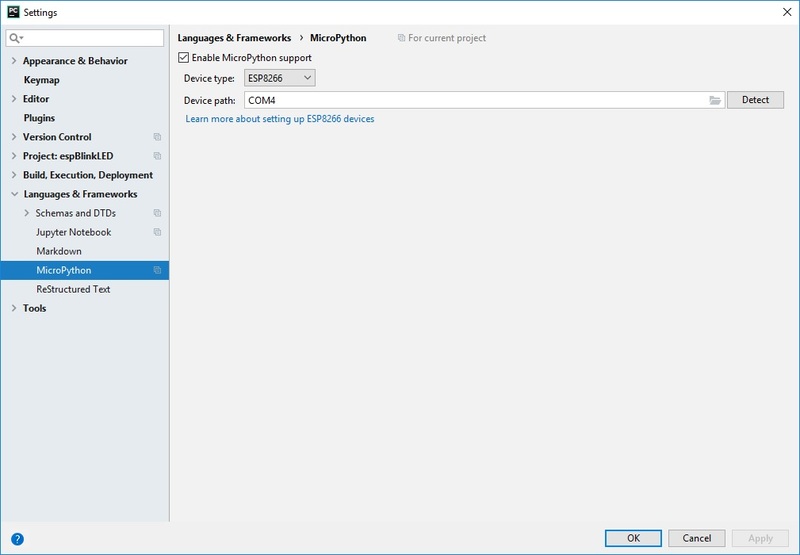 You can now work directly with your ESP (or other) MicroPython board without having to leave PyCharm! But wait, there is more! 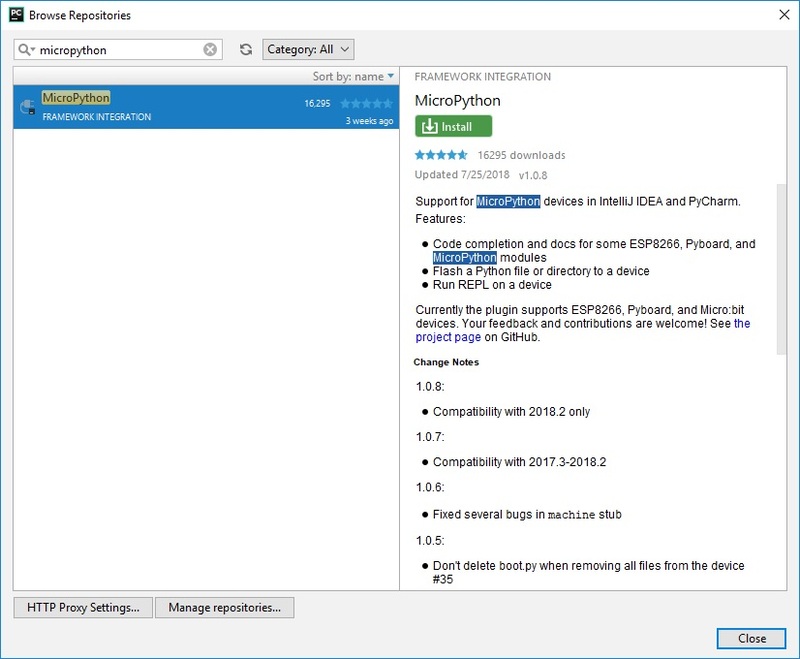 The MicroPython plugin also includes support for context aware completion and documentation (ctrl-Q), syntax checking, and type checking. Go PyCharm! 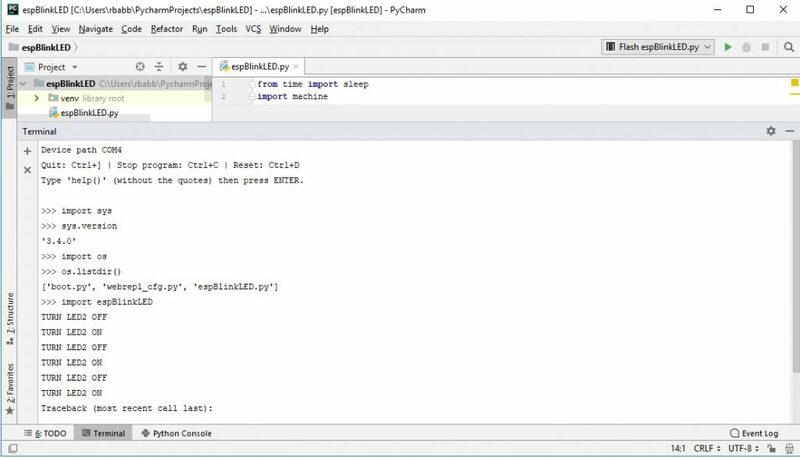 In this post we will be covering how to connect to the MicroPython interpreter (REPL) over the wireless network. 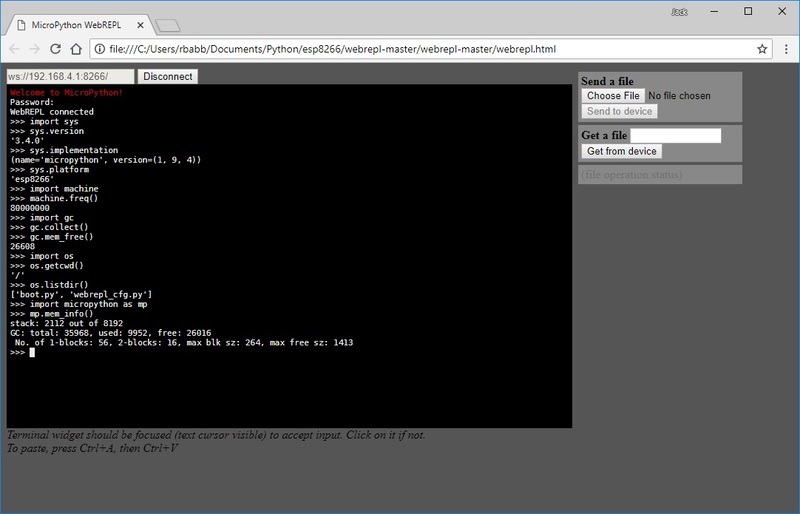 MicroPython includes a web interface to REPL and file transfer. MicroPython supports a web interface that provides REPL (Read Execute Print Loop) access and file transfer capability. Before we can access WebREPL we need to bring up the ESP’s wireless access point. The ESP family supports both station and access point WiFi operation and a wide variety of encryption algorithms for WiFI security. 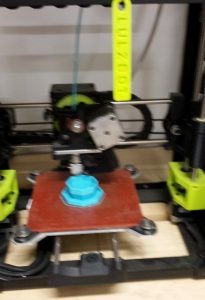 In this post we are just going to cover bringing up the ESP as an access point to get WebREPL running. Connect to your ESP REPL via USB and serial terminal. See the previous post if you need to flash and configure your ESP for access via USB. ESP32 Notes: As of 7/2018 the stable 5/11/2018 ESP32 build “webrepl_setup” import didn’t work for me. However, the daily ESP32 build did work correctly. See the previous post if you need to flash your ESP32 with a new build. Another difference between the ESP32 build and ESP8266 build, the ESP32 network came up as an Open network, the ESP8266 as secure. I’m not sure if this behavior will change in a future build, just something to be aware of. 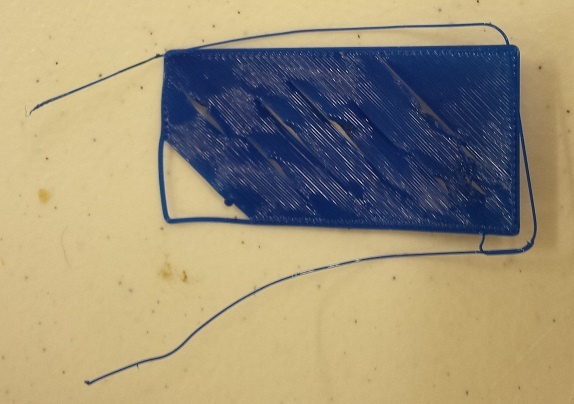 This is OK for quick prototyping but in a production environment you would want to configure WiFI security. You should now see an ESP access point available. Don’t connect to it yet! We need to copy a few files from GitHub before we disconnect from the internet connected WiFi ( assuming you are connected to a WiFi access point). 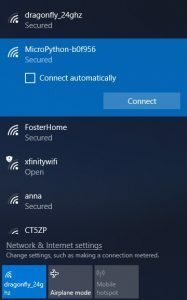 Switch your WiFi connection to the ESP_XXXX access point (AP). Congratulate yourself! You now have a working MicroPython ESP board with WiFi and wireless access to REPL and file transfer. 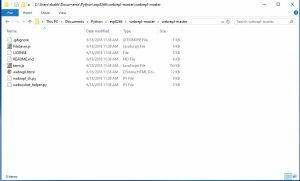 We showed some commands to explore the ESP MicroPython environment, checking on the amount for free memory, listing files, and accessing system information. The Expressif ESP8266 is THE inexpensive IoT platform for makers and professional IoT developers. Over 100 million ESP chips have been sold. 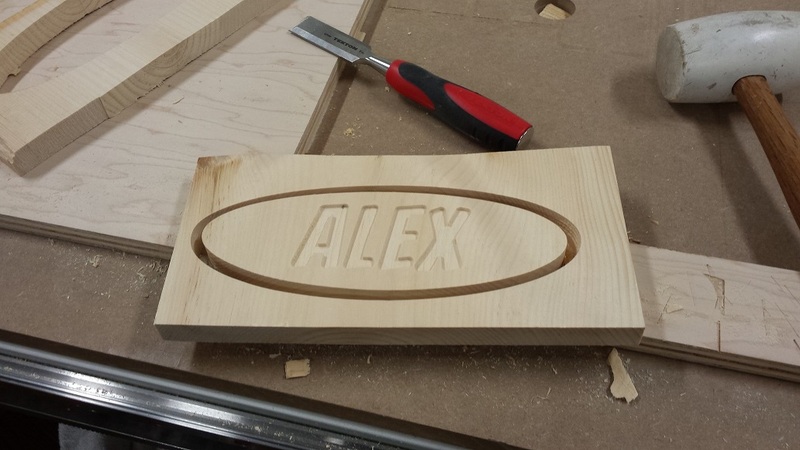 What makes the ESP8266 family so special? Why should you bother with it? The answer is: it has WiFi, a capable processor, great development options, great support, and finally, PRICE. All the Expressif SOCs (System On a Chip) are available on boards costing under $10 US in 2018. The Expressif ESP family of SOCs launched a revolution in low cost WiFi development boards. In 2014 Expressif released the ESP8266EX a SOC combining processor and WiFi in a low cost package. In 2016 the more powerful ESP32, adding Bluetooth, was released. A lower cost version of the ESP8266EX, the ESP8285 with 1MB of integrated flash was also released in 2016. A wide variety of development languages and environments support the ESP family: C/C++, Python, LUA, Arduino, MicroPython, MongooseOS, FreeRTOS. We are only going to be looking at Python for now. So, how do you choose a Python development board and environment? We will show you how! It’s easy! We are only focused on Python, so that eliminates all the other development environments and leaves us with only Micropython and CircuitPython. Adafruit developed CircuitPython, a variation of MicroPython, focused on supporting Adafruit boards, such as the Circuit Playground, Huzzah32, etc. You can find out more about Adafruit CircuitPython boards here. The next criteria is cost. Adafruit makes a great product, but they cost more than a mystery brand board available on ebay or Amazon. Don’t get me wrong I love Adafruit products and CircuitPython. Adafruit has some great low cost boards that support CircuitPython, the Trinket M0 is only $8.95! Unfortunately, the Trinket M0 doesn’t include WiFi. The Adafruit boards provide extra features for that additional cost, built in RGB LEDs, battery connectors, builtin sensors. 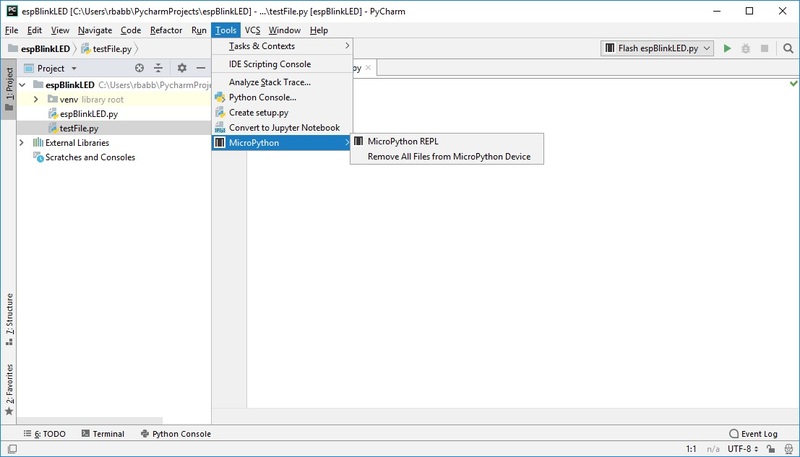 Details of the differences between MicroPython and CircuitPython can be found here. So, For “IoT on the Cheap” that leaves us with MicroPython and “generic” ESP boards. 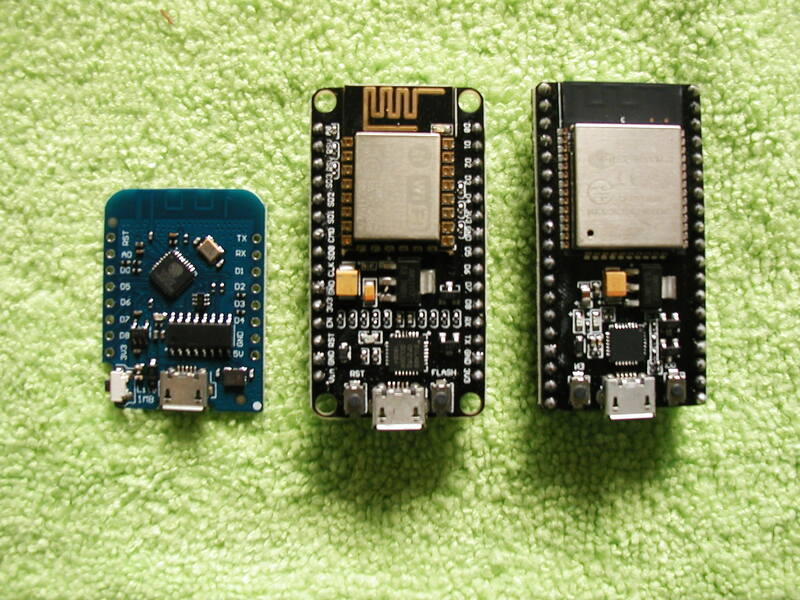 We still have three choices of boards based on Expressif chips: ESP8285, ESP8266, and ESP32. To keep costs low support circuitry around the ESP chips is kept to a minimum. The board designs are open source. The decision of which board to use is fairly straight forward, if you need more I/O, processing power, or storage, you need to move to a more expensive board. The tool chains for all the boards are identical. 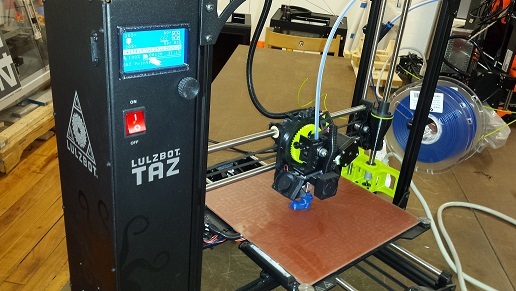 However, there are some critical differences in the settings required to setup the boards. The ESP32 MicroPython image also has different defaults on some values than the ESP8266 boards. Next steps: Setting up the boards for MicroPython on Windows. 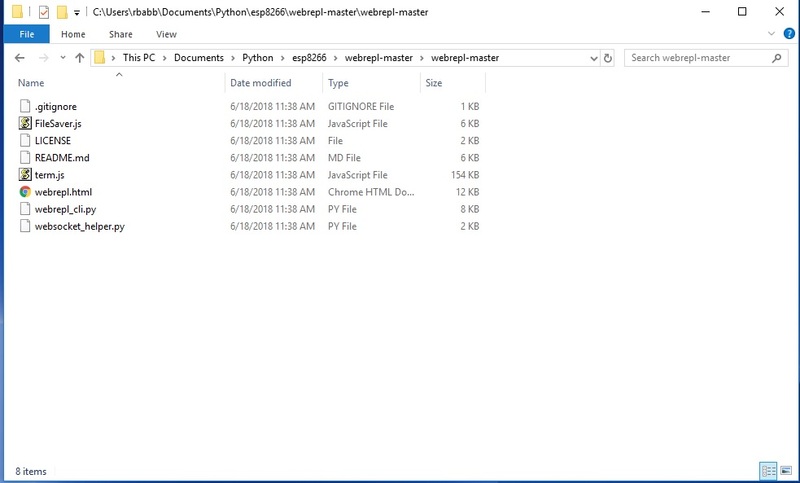 Download and install Python 3 from here. Make sure Python is in the path and environment variables are set if needed. 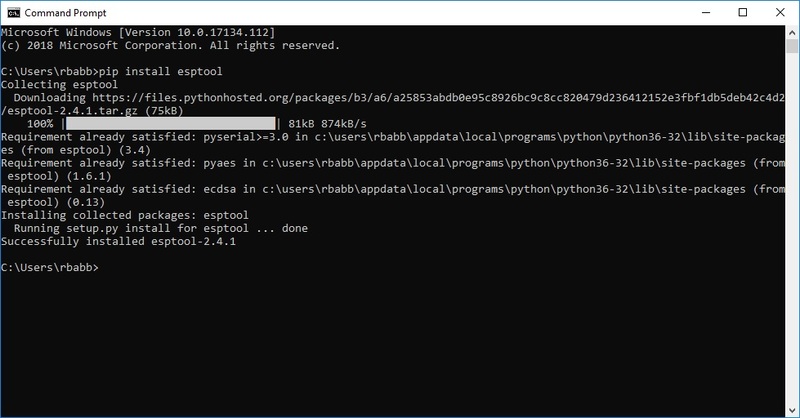 Detailed Python installation instructions for Windows can be found here. 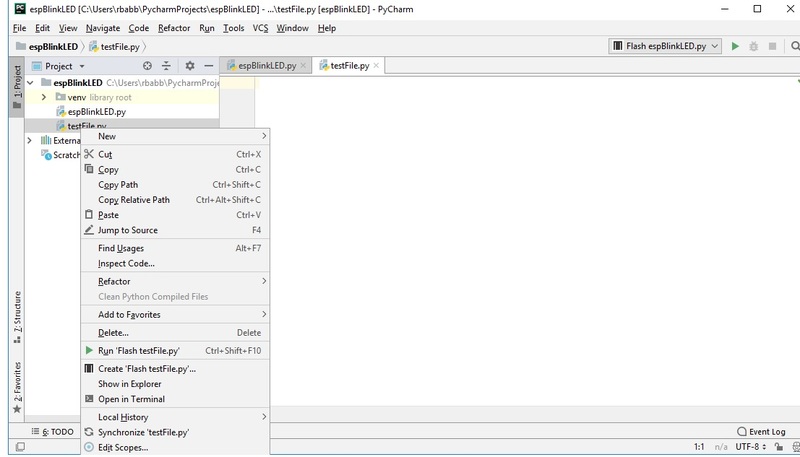 Enter python into the text box. You should see a command prompt and Python version information displayed. The esptool -h command will also display version and full usage information. Now for some fun! 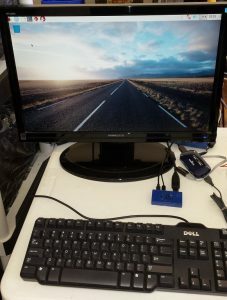 Connect the ESP board to your PC using a USB cable. You should see a new serial port in the device manager. The ESP board should appear as a COM port under “Ports”. Dowload latest micropython stable version. Try to use the stable versions of the firmware. If you use a daily version of the firmware you will probably want to disable MicroPython debug output. Next erase the flash memory on the ESP board. 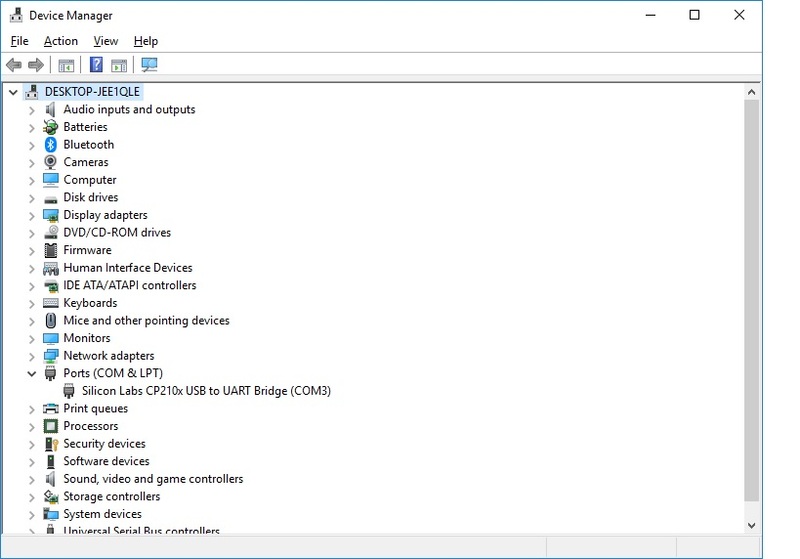 I like to specify the COM port as displayed in Device Manager. For the ESP32 you will need to specify the chip type as the default is the 8266. You may need to press the flash button on some boards. Install Putty (Tera Term can be used as an alternative. However, I found setup more error prone.) 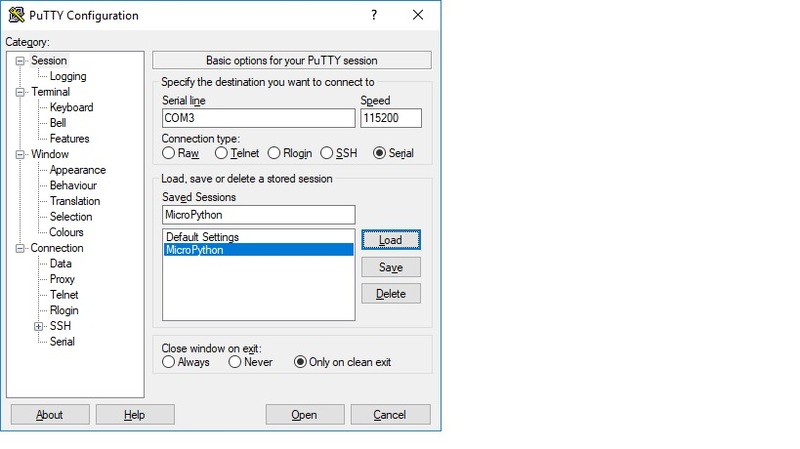 I created and saved my settings as “MicroPython”. 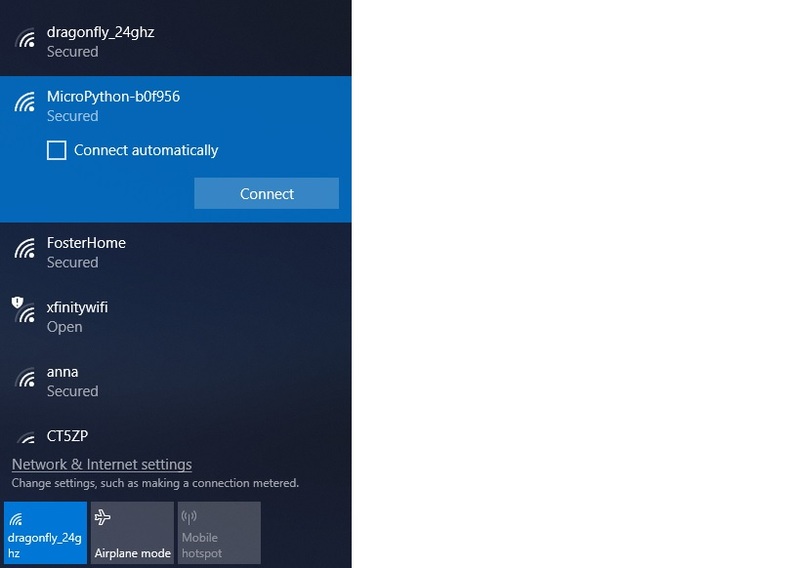 The next time you connect you can just load the correct settings. 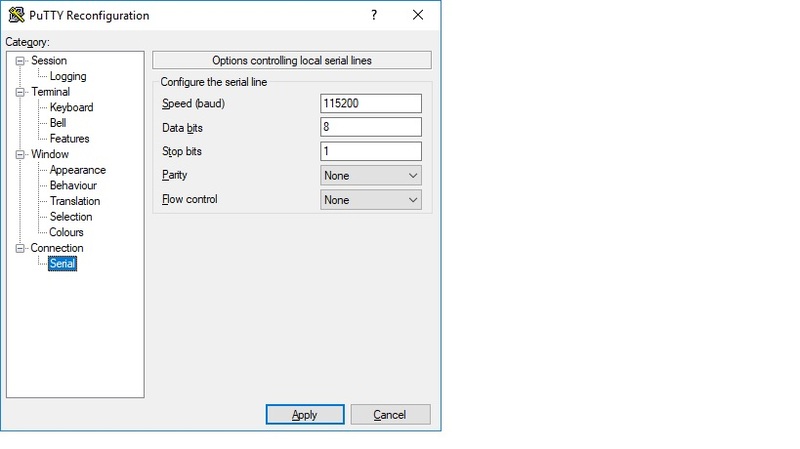 Make sure the Serial settings are configured as no parity or flow control. Connect to the board. You should now see a REPL prompt. A quick check of the Python version will verify that REPL is working. Congratulations you now have a working MicroPython installation! The Arduino and the AVR microcontrollers are best for low cost, hard real time, low power, standalone applications, such as wearable electronics, driving LEDs, and simple control applications. The Netduino and NETMF systems are best at networked complex soft real time control applications. The NETMF microcontrollers are particularly strong if you are interfacing to other Microsoft technologies, such as DWPS or WCF web services. If your project is graphics intensive the Raspberry Pi is the clear winner. The RPi running Raspbian Linux also makes a great low end development platform. 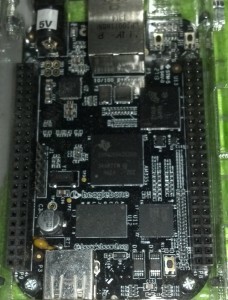 The BeagleBone Black has the most capable hardware. If you are pushing the limits of performance or available I/Os the BBB could provide the extra capacity you need. 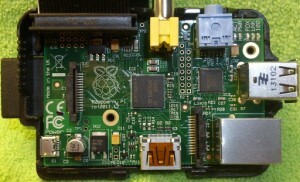 The Raspberry Pi is an inexpensive , under $50, small single board computer using a Broadcom BCM2835 chip that includes a 700Mhz ARM processor. 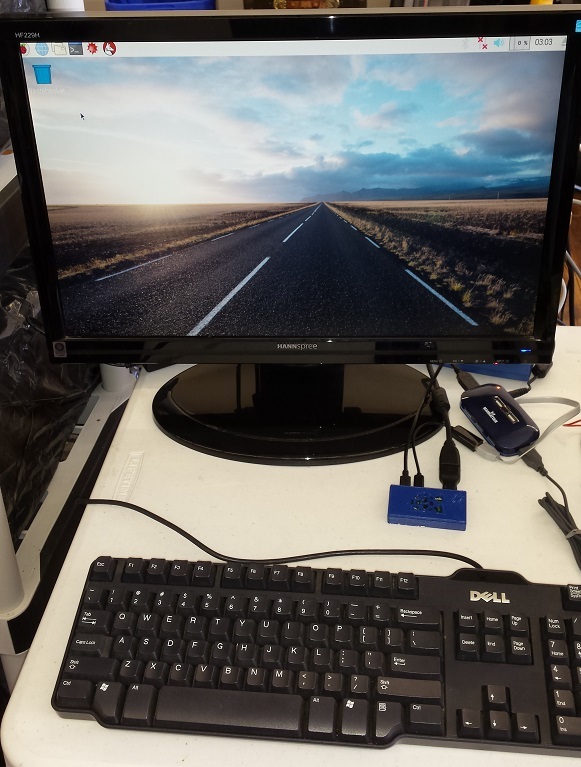 The system also supports HDMI graphics and ethernet. You will need to supply your own 4GB or larger SD card for storage. The board supports several Linux distributions. The easiest way to get started is with the NOOBS (New Out Of the Box Software) install. Raspbian, a version of Debian Linux targeted for the Raspberry Pi that’s maintained by the Raspberry Pi Foundation, is recommended for the initial install. The Pi is inexpensive enough to use as an embedded system and powerful enough to use as a low end Linux development system. In fact I have my Pi configured as an Arduino development system! I also use CuteCom to debug serial communications with my NetDuino and XBee modules. Clementine also makes the Pi into a great internet radio. I have to admit that I have been having so much fun using my Pi as a low end Linux box that I have not spent much time interfacing it to hardware. The Pi can support: 8 GPIOs, 1 serial port, 1 SPI bus, 1 I2C bus. There are some really interesting projects available to support device control with the Pi. Adafruit has a customized Linux distro targeted at educators and makers: Occidentalis. 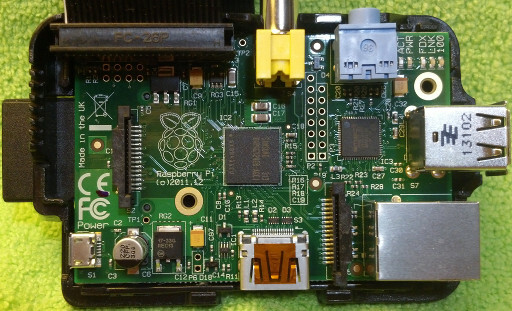 You can use just about any programming language to program the Pi, hey it is Linux after all. However, out of the box Python is probably the best supported. Python and the Idle3 IDE are installed by default on Raspbian. The RPi. GPIO library supports access to Pi GPIO pins. A good description of RPi I/O is available here: http://elinux.org/Rpi_Low-level_peripherals . The Pi was designed for “serious” I/O to be located on a daughter board. A list of expansion boards is available at elinux.org.